Volumetric Technologies designs and manufactures the highest quality Pump Fill Stations in the industry. Our Pump Fillers reliably fill and package a wide variety of products that include food, dairy and bakery products. These Pump Fillers have many uses, but are mainly used in institutional kitchens and commissaries for soups, stews and ready to eat products. All product contact surfaces are 316L stainless and USDA / FDA approved materials. At the heart of every Pump Fill Station is a Volumetric Technologies’ 90 Series Piston Filler / Depositor. These machines are the workhorses of the food industry. They accurately and cleanly fill and deposit your products into your bags. The reliability of a Volumetric Technologies Piston Filler / Depositor has been tested and proven for more than 20 years in the industry. We also offer two seal types with these machines, a tipper tie clip model, or a heat seal model. There is also a vacuum sealer option available. The filling function is started by depressing the foot pedal, which provides a single cycle to fill a pouch. The operator can also keep the foot pedal depressed for a continuous cycling to aid in transferring product as well as purging the product out of the Piston Filler at the end of a production run. The Pump Fill Station includes pneumatic flow controls to regulate fill and recharge speed as required. Designed for daily cleaning by wash down or in-sink cleaning methods, the Pump Fill Station requires no tools to disassemble or reassemble. 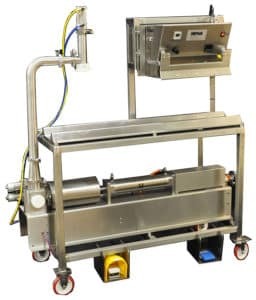 Volumetric Technologies food Pump Fill Stations are used to semi automatically fill a wide variety of products into bags which are then sealed. Products range from Salsa, soups and stews, cheese sauces, refried beans and pasta sauces just to name a few. Contact us about your application to see how we can help.